There are 7 impact laws. Ground Contact, Face Contact, Clubface Direction, Club Speed, Swing Path, Angle of Attack, & Dynamic Loft. You need to come in and see how Engineered Golf’s custom clubfitting will improve each one of those aspects. I am relaying an important golfing truth that has been nicely presented by Adam Young of Adam Young Golf - https://www.adamyounggolf.com. Adam has worked at some of the top facilities in the world, including the Leadbetter Academies and the World famous Turnberry Resort. He currently teaches in Santa Barbara, California. Adam is the author of “The Practice Manual – The Ultimate Guide for Golfers” – an international best-selling golf book in 5 countries, and featured on The Golf Channel. Adam is a truly holistic golf coach, seeing the game as more than the sum of its parts. Adam’s blog reaches over a million golfers each year, discussing everything from the technical to the philosophical. Adam teaches that the only way you can improve your golf is to improve the following factors. You don’t have to improve all of them – a simple adjustment to ground contact alone can have significant effects on your game and scores. However, the more of these factors you improve, the better and more optimized your golf game will be. That's a fact! Why? It's because these are the physical laws to which the golf ball abides. You will always be limited in your distance by the speed you can create. 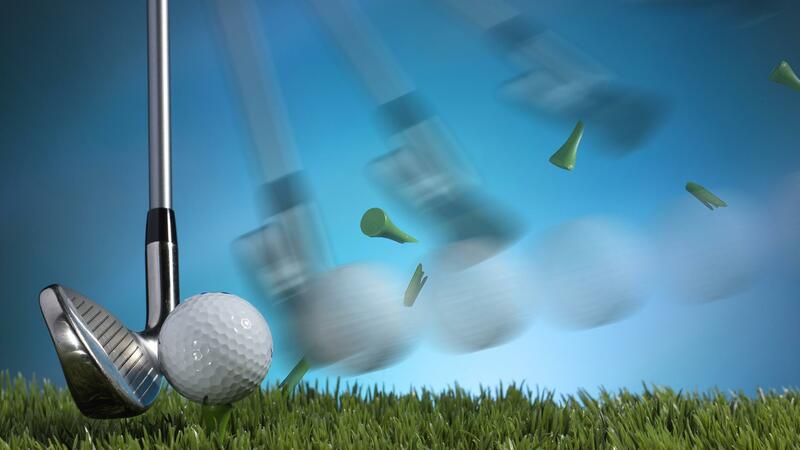 The pros hit the ball much farther because they are close to 50% faster than the average amateur golfer. One thing is for sure, all else being equal, a faster clubhead speed produces more distance. Do you strike the sweet spot? The professionals strike the face in a far more functional spot and with incredible consistency. Amateurs, on the other hand, can be more random with their strike, or can be consistently on the wrong part of the clubface. 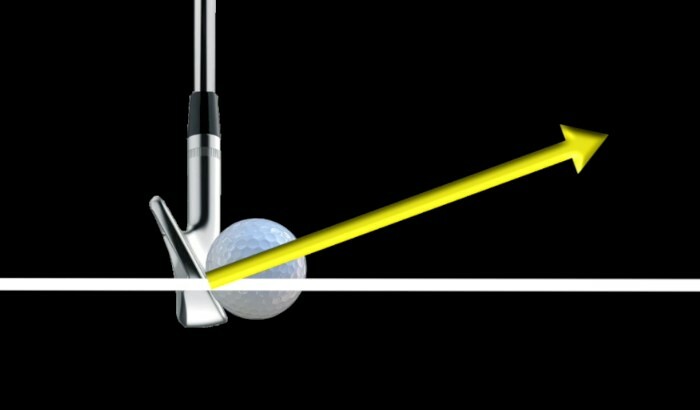 This costs amateurs a lot of distance and can make a player look foolish when they strike the extreme edges of the club. You can play great golf with a swing path that is offline (as Bubba Watson regularly demonstrates). However, your swing path will determine whether you are a fader of the ball (for a right-handed player - curve the ball to the right onto your target), or a drawer of the ball (for a right-handed player - curve the ball to the left onto your target). 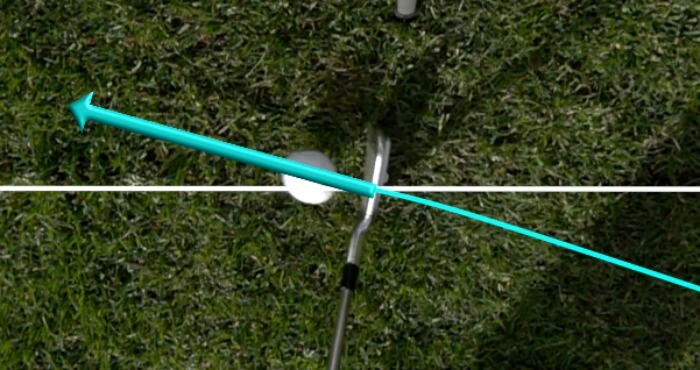 The blue arrow represents the club path through impact, as viewed from a golfer’s perspective. Want to know the quickest way to improve your shot direction? Improve where your club face looks at impact. 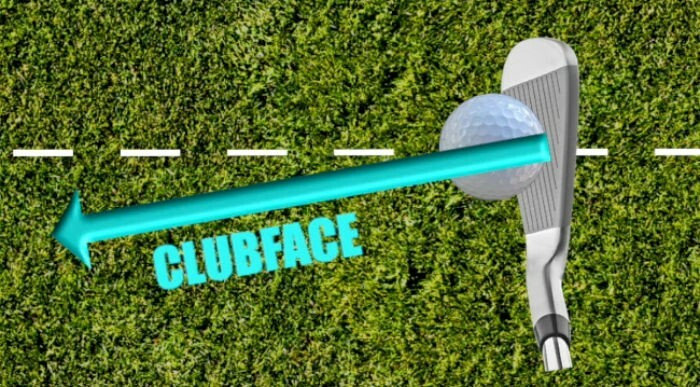 While there are other factors involved in direction, club face control is the single biggest factor. If you want to launch the ball higher or lower, you have to change dynamic loft. This is the loft you present to the ball at impact and has a 60-85% influence on the launch angle. This is very likely the biggest differentiator between amateur and pro golfers. 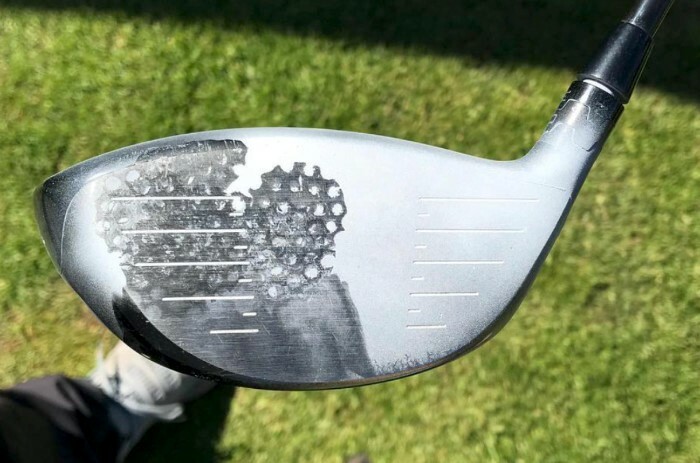 With irons, the pros hit the ball first, then the ground. Amateurs (well over 95%) strike the ground first. This factor relates strongly to distance control – a key source to a lower handicap. 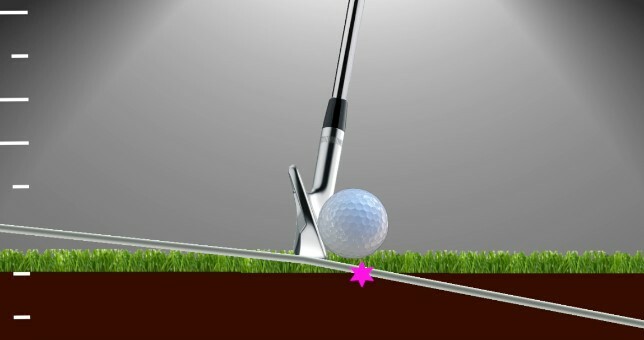 Golf pros strike the mud (pink star) after the ball is struck for the majority of their shots. By now, I hope that you might have read our Shaft Fitting page outlining our special work in fitting shafts and properly installing them in your golf club. If not, you can always go back and review it. Click Here. At Engineered Golf, we have been able to take custom clubfitting and shaft fitting and use them to nicely influence six of the impact laws. We correctly get your club length and lie angles dialed-in precisely for center-face contact. Center-face contact is the most efficient way to increase both distance control and accuracy. We dial in the the proper total weight of the club to achieve proper acceleration and peak speed into, and at impact. By also matching the proper weight of the club to your unique golfing DNA, we can influence and help overcome much of an unwanted slice or hook. Club path produces side-spin that causes those curving shots. Too much side-spin isn't a good thing; we help to reduce it by dialing in the correct total club weight. It reduces the unwanted bias of an undesirable club path direction. The proper balance of the club between the weights of the shaft and the head are determined through launch monitor testing. 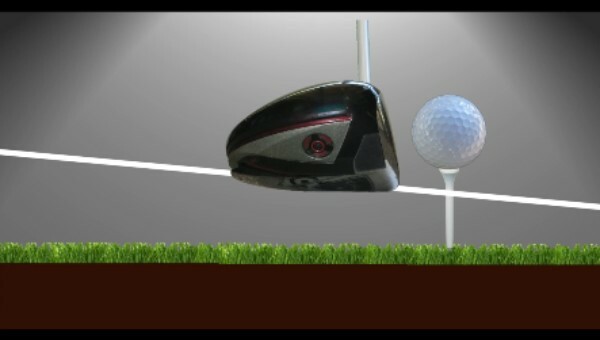 Your ideal balance ratio enables the face to be stable and pointed correctly into impact. More shots end up closer to your intended target. Get all of the parameters right, and we get you to instinctively swing with increased confidence and repetition. You'll find the proper angles of attack with correctly fitted golf equipment. If you wish, we can deal with the seventh impact law - ground contact - through highly effective coaching and show you how to repeatably achieve it. 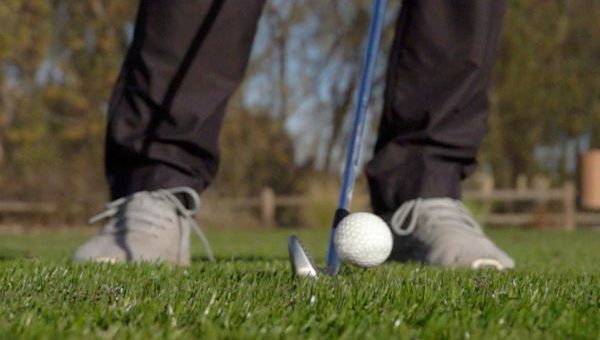 We help you to mimic the desirable "pro" divot position on the far side of the ball. We'll go to great lengths working with each client using our expertise in clubfitting and clubmaking to create their best feeling and scoring set of golf clubs. We can do that for all the clubs in your bag. Call us - we'd love to show you the huge difference we can make by working together. Interested in learning more, or would you like to book an appointment for a consultation or fitting? Look us up.